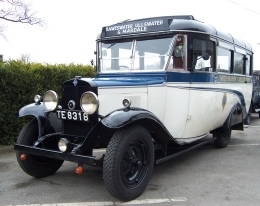 An American designed coach and the predecessor of the famous Bedford, this Chevrolet undertook daily tours during the summer season from Morecambe to the Lake District until the 1950's, operated by Jardines / White Heather - who also operated the Society's Austin 16 as a taxi. The coach (and the 16) were acquired from Jardines by the Societys founder member, Vincent LeTall, and both vehicles now form part of the Society's collection. Interestingly, we have recently located a note in the archives from the operator of the coach which states it has a NORTHERN COUNTIES of Wigan body. Does anyone have any knowledge of this or NC in general? We believed TE 8318 had a Spicer body, although no body plate can be found on the vehicle. We thought NC was basically a service bus builder. Although generally in the condition in which it was last used, the coach has been thoroughly serviced and an electrical overhaul has been carried out. The radiator, water pump and rear springs were re-conditioned in 2006/7 and the driver's door step was replaced in 2007. January 2009 - The new windscreen glass has been obtained and is now fitted into the framework. Some minor work is to be carried out on the wood frame before the chrome glass frame is refitted. A new driver's door step has been fitted, and the driver's door has had to be realigned; after all the 'Chev' is 79 years old The radiator and its surround is also back in place ensuring it should soon be back on the road for the Society's 50th birthday. April 2009 - New tyres have been fitted to both front wheels, and the wheels have also had a coat of paint. The headlights have been re-fitted; also the wiring has been checked over and a new 6 volt battery obtained. Following a service, the 'Chev' returned to the road on our Easter Sunday Open Day. July 2010 - The 'Chev' now has two new bonnet catches, these new catches were made to a very high standard by Peter L. .
July 2011 - The driver's seat has had new runners fitted, this will make the seat adjustment a lot easier.